In February 2013, with a generous gift of $2.25m from Daniel Temianka and Zeinab Dabbah, Chapman University endowed the Henri Temianka Professorship in Music and Scholarship in String Studies, in memory of the gifted and indefatigable artist and ambassador of classical music. The Temianka Endowed Professorship was established to enhance the acclaimed string studies program for violin majors at the Hall-Musco Conservatory of Music, and string faculty member Professor William Fitzpatrick was announced in 2013 as the inaugural holder of this important post. William Fitzpatrick continues to hold the Henri Temianka Professorship in Music and strives to bring his knowledge, expertise and distinguished stature as a leading international violinist to the students of Chapman University’s Hall-Musco Conservatory of Music. Recently, he has given Master Classes in violin at the San Francisco Conservatory, Saddleback College for Myriam Cottin-Rack (President of ASTA-Stockton) in Stockton, CA for Ann Kerobyan, in San Jose and for the Junior Chamber Music in Irvine, CA. Professor Fitzpatrick's pedagogy is being constantly recognized now, nationally and internationally. He has been invited to produce over 29 videos for Virtual Sheet Music since November 2013, which has been viewed by over 70,000 people. He has given violin recitals at Emory, Oxford College, the Parnassus Society in Irvine, CA and the Syntonique Soiree in San Francisco. Professor Fitzpatrick has been enlisted as a Board member of the Parnassus Society in Irvine, CA and Renaissance Arts Academy in Los Angeles, CA. A bronze portrait bust of Henri Temianka was dedicated at Chapman in 2013, and was previously found adjacent to Bertea Hall. Upon completion of the Marybelle and Sebastian P. Musco Center for the Arts in spring 2016, Temianka’s bust was placed in the Bette and Wylie Aitken Arts Plaza adjacent to the Center, between the busts of Mozart and Puccini. Henri Temianka (1906-1992) was a significant figure in the classical music world during the 20th century. One of the era's foremost concert violinists - who performed more than 4,000 concerts during his long career, and whose virtuoso talents made him a global favorite and an icon of the Southern California music scene - Temianka was also a prominent conductor, educator and author, and founder of the renowned Paganini Quartet and California Chamber Symphony. Chapman University’s Hall-Musco Conservatory of Music has named Arturo Balmaceda, ’18, Eileen Kim, ’20, Christopher Nelson, ’21, and Lisa (Risa) Yoshida, ’18 recipients of the prestigious 2016-17 Temianka Violin Scholarship. These talented string musicians were chosen on the basis of their exceptional artistic merit and each will participate in The Chapman Orchestra and small ensembles throughout the academic year. The Temianka Violin Scholarship is awarded annually to Chapman University string students who exemplify the same spirit of creative talent and scholarly passion as its namesake. Temianka’s son Daniel and daughter-in-law Zeinab Dabbah, M.D. (J.D. ’12) have also donated an Albert Saparoff violin and bow to the University for exclusive use by a designated Temianka Scholar, and established the Temianka Violin Endowment to engage a luthier to annually inspect and maintain the violin to the highest standards. Arturo is from Poway, CA and is the first in his family to attend college. He began the violin comparatively late for someone with his degree of skill, and only began private study in the second half of his high school freshman year. His teachers quickly recognized his leadership skills and personality as he advanced to concertmaster of his orchestra. His academic achievements were significant and as result he was awarded a Chancellor’s Award from Chapman University to assist his study here. 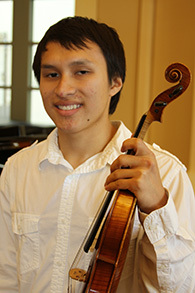 In recognition of his considerable musical abilities and aptitude, the faculty of the Hall-Musco Conservatory of Music selected Arturo to receive a four-year Temianka Violin Scholarship beginning in 2014. Arturo also holds a black belt in karate (his fellow quartet participants have been warned)! He has shared with Professor Becker that one of the hardest adjustments to college life is the increased expectation for practice time and the higher standards imposed by the Conservatory. Most enjoyable for him have been the engaging orchestra rehearsals led by Professor Daniel Wachs. The challenges of violin study with Temianka Professor Fitzpatrick will be an exciting change in his violin playing. 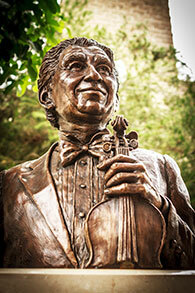 Prior to arrival at Chapman, Arturo had only learned etudes for auditions — not as a regular course of study. His technique development was learned through concerto and sonata study. During his high school career, he participated in the Italian-American Opera Festival at Soka University under the baton of Maestro Stephano Vignati. In May 2017, Arturo participated in the 2017 OperaMaya Festival Orchestra, first violin, second chair position on a full scholarship. 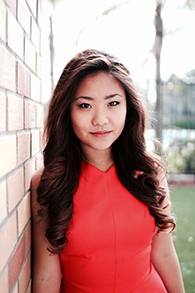 Eileen Kim continues her double major of violin performance and business administration. In January she participated in Chapman’s recruiting tour and recently competed in the Miss California pageant where she won the top talent award. She is set to graduate early due to her advance AP and scholarly work on campus. 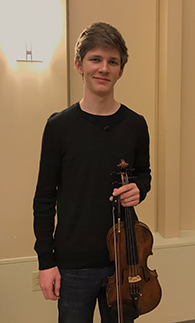 Chris Nelson is the second recipient of the Henri Temianka-Albert Saparoff Violin. He was the first prize winner for the Bach Festival in Los Angeles and was presented in recital last October. Chris also recently participated in the Chapman recruiting tour with the Chapman Student Quartet in January of this year and serves as assistant concertmaster for The Chapman Orchestra. 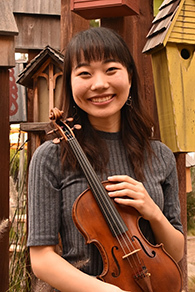 Lisa Yoshida is a junior at Chapman University pursuing a Violin Performance Major with a French Minor. She is currently a student of Professor William Fitzpatrick. Lisa began studying the violin at the age of nine, and attended the Orange County School of Arts for high school. Recently, in January of 2017, she and her string quartet had an amazing opportunity to participate in a master class with Hank Dutt, violist of the Kronos Quartet. She has also attended the Viola Workout in Crested Butte, Colorado in 2014 and 2016. Emily Uematsu, ’15 was recently awarded the Parnassus Award and presented a recital at SOKA University on June 17, 2017 with Cheryl Fielding, piano. Her debut recital in New York two years ago was sponsored by the Heifetz Society. She has been working at Shepherd School of Music on her Masters with Paul Kantor who visited the Chapman campus in April 2017. Kimberly Levin ‘16 opted to take a year off from academic study after graduation. She is presently the violin coach for Tesoro High School's wonderful orchestra program in addition to keeping up an active local performance schedule. Chloe Tardif, ‘16, the first holder of the Albert Saparoff-Temianka Violin, continues her Masters work at Rice University with Professor of Violin, Paul Kantor. She once again attended the prestigious Aspen Music Festival last summer and also studied with Connelia Heard from Vanderbilt Blair Academy of Music. The luthier who prepared the Henri Temianka-Albert Saparoff Violin and bow for transfer to Chris this season is Boris de Granda, master violin maker and restorer located in Newport Beach, CA. Chapman University, a comprehensive private university located in the heart of Southern California, has been renowned for more than 70 years for its outstanding music programs, which are today concentrated in the university's acclaimed William D. Hall and Marybelle and Sebastian P. Musco Conservatory of Music. The Hall-Musco Conservatory offers world-class professional programs in instrumental and vocal music, leading to the Bachelor of Arts in Music degree and the Bachelor of Music in Composition, Music Education and Performance degrees. The Hall-Musco Conservatory's highly trained vocal and instrumental musicians, conductors and composers have graduated to perform and work with many of the world's top symphony orchestras, opera companies, and choral ensembles as well as on the Broadway stage; or are engaged in music education throughout the United States and abroad. The Hall-Musco Conservatory of Music provides aspiring musicians with a rigorous, professional training program coupled with a supportive liberal arts environment that enriches the human mind and spirit. This outstanding curriculum prepares our students to enter the music field directly or continue their studies in top graduate programs throughout the country. For additional information, please contact the Hall-Musco Conservatory of Music at (714) 997-6871 or music@chapman.edu.